• To achieve PR coverage and television exposure within Portugal, and also throughout Spain, Greece, France and Italy. • To provide the opportunity for the public to trial the chilled product. • To gain high profile presence in public locations with high footfall (Excess of 50,000+ local consumers. • To stimulate and engage the consumers with the association of ice and chilled serve of the product, in a typically hot environment. 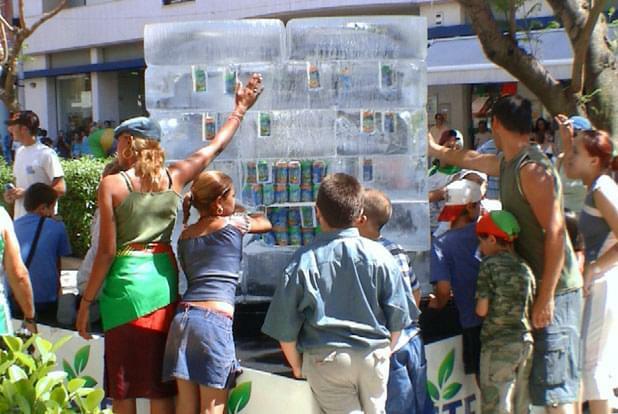 Innovative Solution: The Icebox team worked with Momentum at their European HQ in the planning stages to develop the most effective solution to meet their client Nestlé’s objectives. 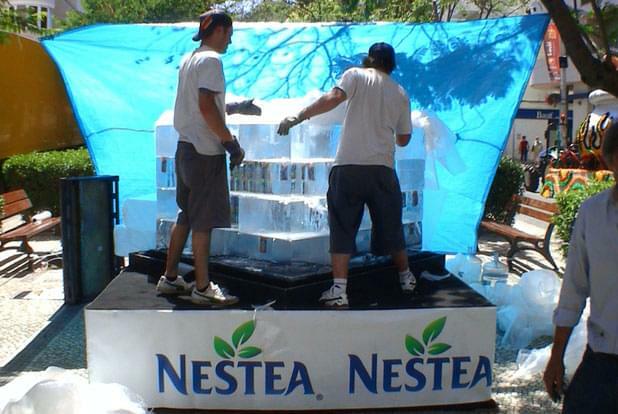 A challenge was to use enough ice at the various events to not only last as long as the fan sites were open, but to have the scale to create the required impact. 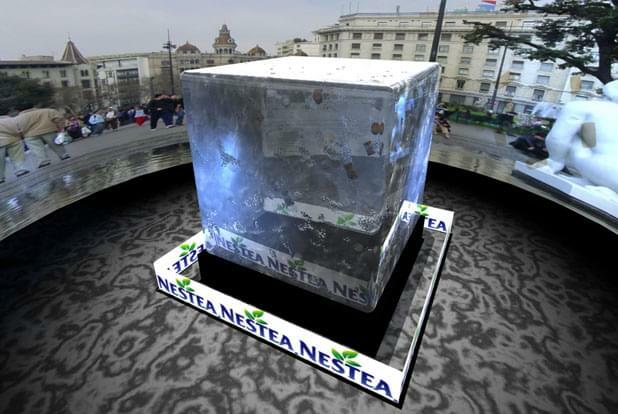 The solution was to create 1.5m cubes of ice with product placed inside the ice at each site, accessible for the public to touch the ice and sample the chilled product. Working over 900 miles from base, The Icebox treated the events over a four week period as two separate projects logistically. Two expert Icebox teams handled two consecutive weeks each. 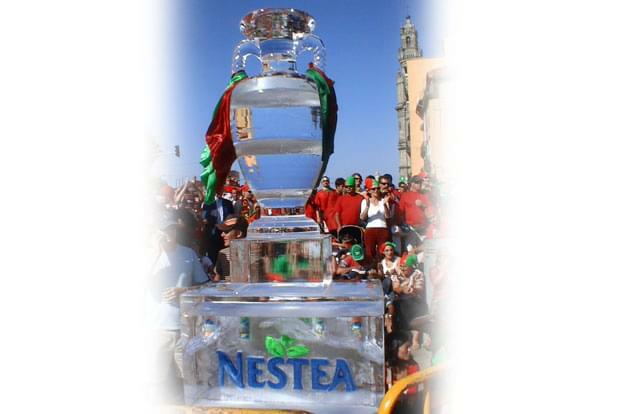 The roadshow of ice installations was managed by the Icebox, on time in every location. The Icebox project manager on each team also took on the management of the chilled stock and distribution by sampling teams that were at each site. • Two 17.5 ton freezer transport lorries & two Icebox support freezer vehicles, covered over 3000km’s in ferry & road travel from the UK and throughout Portugal, from the Algarve to Lisbon and Porto in the North. • The installations used over 21 tons of solid, clear ice!The team successfully managed the installations, maintenance, and safe removal of the ice, often in direct sunlight in over 40 degree heat conditions. All of the brand engagement and sampling was completed successfully during each ‘fan site’ event. Dynamic Result: The scale, regional series of events and original approach to communicating the brand messages with the audiences in Portugal, were a huge success. Nestle and Momentum were delighted with the faultless execution by the Icebox team, and the quality and impact of every installation.